CAULIFLOWER HAS BEEN THE NEW KALE FOR AWHILE NOW. AND FRANKLY, I PREFER IT THAT WAY. It's so versatile that you can turn it into rice, steaks, pizza crusts, and use it raw or cooked. And, being that it's from the cruciferous clan of veggies, it's really healthy for you too. 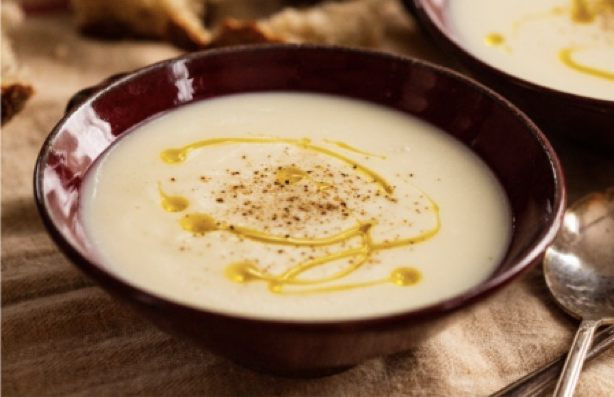 This soup goes back to the basics, and is so simple, and so, so creamy even without any dairy, that I'm sure that it will become a winter favorite. WITH SO FEW INGREDIENTS, THE QUALITY IS GOING TO BE IMPORTANT here. Make sure the cauliflower is fresh, preferably organic if you can, and has no black spots. However, the true magic behind this soup is Paul Bertolli's (of Chez Panisse fame) technique. SO MAKE SURE TO FOLLOW THE DIRECTIONS CAREFULLY! If you do, you'll see how just one onion, one head of cauliflower, some olive oil and /or butter, salt and water can be transformed into an exquisite 5 star soup.